Red and black currants (not related to Zante currants, a type of raisin) are often an ingredient in German desserts and sometimes meat dishes. 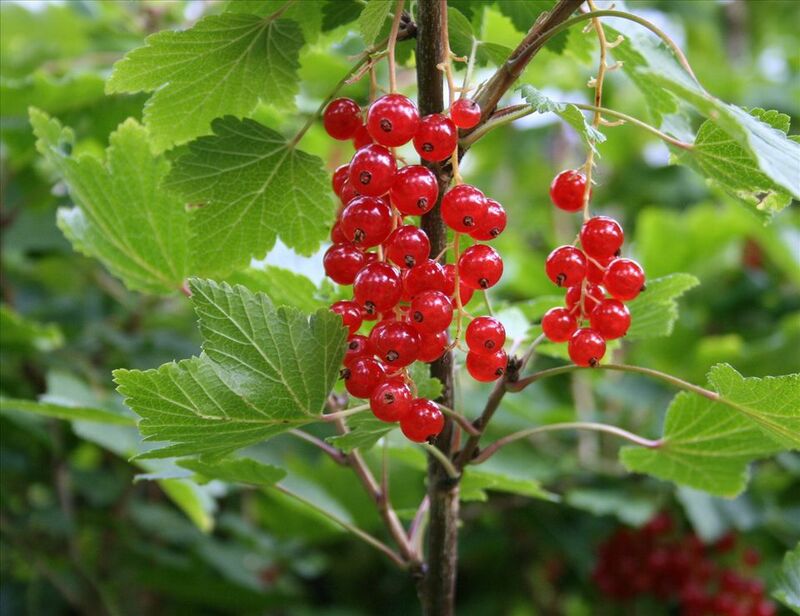 The evergreen currant has been cultivated since the 15th century in Europe, crossing different Ribes species along the way to make garden currants (Ribes rubrum var. domesticum). Cultivated redcurrant (either spelling is acceptable) bushes stem from the shrub native to Europe, which grows up to 5-feet high. They carry their fruit in racemes, or grape-like clusters, which make harvesting the fruit, fairly easy. The German word for currants, "Johannisbeeren," is named after John the Baptist whose birthday is believed to be June 24th, about the time that the first berries are ripe. With a high percentage of nectar and sugar per blossom, they are very good for honeybees. You can buy cultivated currant plants at places such as Monrovia Nursery or ediblelandscaping.com. Black currants (Ribes nigrum), "Schwarze Johannisbeeren," are also used in German cookery, although they do not seem as popular as the red ones. They have been planted in gardens since the 16th century, perhaps even earlier. They are harvested from July through August. They are used primarily to make Cassis syrup and Cassis liqueur, sweet, non-alcoholic drinks ("Limonaden"), juices, jellies and jams. The fresh leaves can be used in April and May as a garnish for herbal or vegetable soups. An extract from the flowers is used in the perfume industry to add a fruit note, and the dried leaves are used in some teas. Black currants are more bitter than red currants and both are very sour, only sour cherries and rhubarb are more sour. The black berries have an intensive, sometimes unpleasant aroma, which earned them the nickname "Wanzenbeeren" (literally - bug berries). Black currants are used in natural medicine to treat skin disorders and as a diuretic. In alternative medicine circles, it is used for rheumatoid arthritis, arteriosclerosis and gout. Some people even say they can prevent cancer, colds and heart disease. Currants are higher in vitamin C than oranges. They also contain quantities of vitamin A, phosphorus, and potassium. They contain around 40 calories per 4 ounces (37 per 100 grams) and 7.5 grams of fiber. Make sure that the berries look full and are shiny red or black. They keep a few days at home. You can also purchase them frozen, either in "Waldbeeren" mixtures in Germany ("Fruits of the Forest" mixes) or alone. They are often sold frozen on the stems, removing the berries from the stems while frozen is easiest. Eat them raw, on cakes, or cooked in compote. Juice them for a tart tonic. in a bowl of water, not under running water. Remove the berries from their stems by holding the thick part of the stem and using a fork to run down the stem. Also Known As: In northern Germany they are known as "Ahlbeere", in Switzerland as "Meertrübeli," in Austria and Bavaria "Ribisel," in Swabia "Träuble," in the Pfalz "Kanstraube." Also known as "Gichtbeere" to farmers ("Gicht" means gout).